JELLY | What Does JELLY Mean? JELLY means "Jealous". This is just one way of shortening the word "jealous". (Others include JELLY, JELLO and JEL). 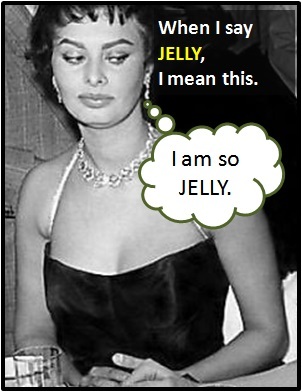 In the UK, the TV show The Only Way is Essex (TOWIE) was responsible for popularizing JELLY (and its many other variations). Of note, these derivatives of "jealous" often describe envy not jealously, and they are contributing to the distinction between these two words blurring. Read more about the difference between jealousy and envy. Person A: Why are you so JELLY of my new relationship? Person B: I'm not. I just think you're rushing into things. Person A: I told her, if she carries on being JELLY, she can't sit with us. Person B: Good. I'm really starting to get bored of her. Ignore the haters. They are just JELLY of you.